Storyteller is strange kind of puzzle game, in that it involves surprising human abilities like finding meaning in sequential images, interpreting text and telling complicated stories with only a few elements. Morphology of the Folktale by Propp: The author gathered a massive compendium of russian folktales and came up with a generative structure that purportedly allows you to reduce any of those stories to a bunch of symbols. A core idea of this deconstruction is the "dramatis personae", stating that only a bunch of possible functional roles exist, like a villain or a mentor, regardless of which character is playing that part at any moment. This simplification is represented in Storyteller in that different characters can play the same functional role, and even change roles during the story! Understanding Comics + Making Comics by Scott McCloud: these books are an absolute must for those curious into how the human mind derives meaning out of a deliberate sequence of images (like comics). The first Storyteller prototype dates to 2008, and since then, I failed several attempts to make a full game out of it, until I came upon these books which showed me a crucial concept: players will fill the gaps between frames, even wide gaps of meaning and even across time and space! If you look closely at the video, you will realize Storyteller is hiding something extremely important in those gaps, but it turns out players can derive meaning even without it. The Great American Bathroom Book + Masterpieces of World Literature: One page summaries of literary classic's plots. At this time of my life, I am not willing to sit down to read such a vast amount of lengthy classics, but I did want to know what Anna Karenina is all about. Many levels in Storyteller are based on these classics. 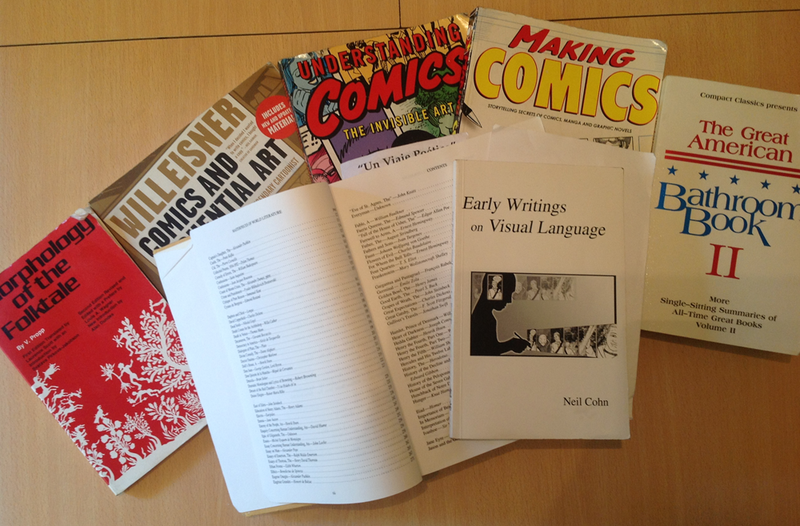 Early Writings on Visual Language by Neil Cohn: This book is what naturally follows reading Scott McCloud. Neil Cohn has taken on the brutally ambitious endeavor of proving that juxtaposed sequential image arts (like comics) are founded on a "visual language" that we parse like we do written word. He goes beyond (and sometimes refutes) Understanding Comics and he even proposes a Chomskian syntactic structure to analyze comic strips! I just saw Northernlion's video, which made me think exactly of McCloud. Very interesting gameplay so far, looking forward to your game's release!